I tell clients.. 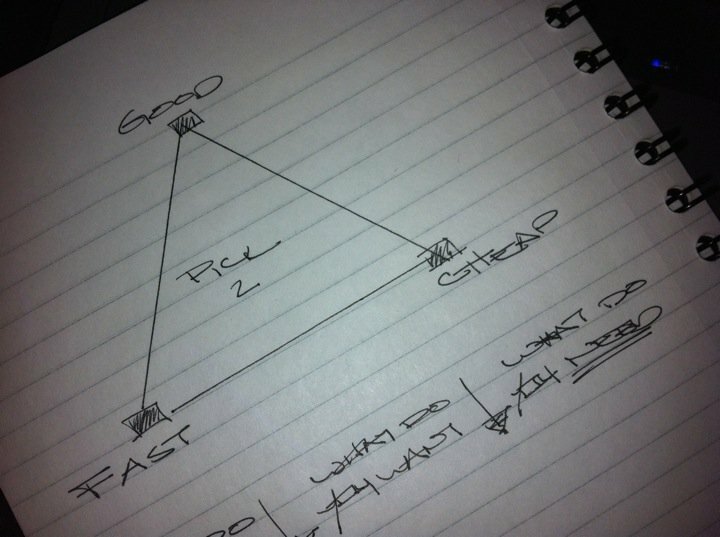 PICK TWO: Cheap+Good, wont be Fast; Good+Fast, wont be Cheap; Fast+Cheap, wont be Good. Its a systematic triangular mantra that promises binary results. That’s business. Now apply this concept to the other aspects in your life… goals, relationships, purpose.. etc. You will find yourself understanding that in which you NEED; appreciating that in which you HAVE; and building a patience for that in which you WANT. May 15, 2011. Para recapacitar. May 30, 2011 at 9:35. Permalink.